Click here to download Album Pricing! Flush mount photo books originated as high-end wedding albums that were custom made by boutique binderies. These books differ from regular photo books by being hand mounted on thick inner board with real silver halide photo paper, giving the book many desirable characteristics including a stronger, tighter, finer, superior core. 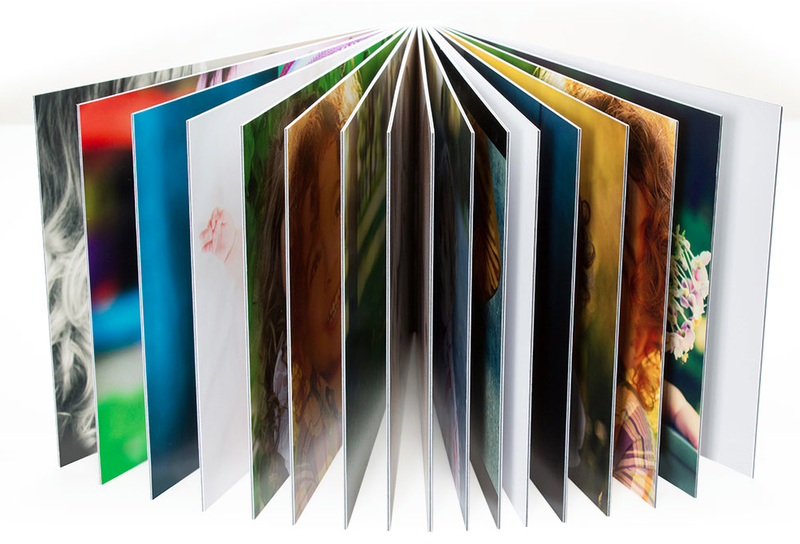 Regular press photo books are low-end, they’re mass produced using inkjet printers and stock papers. You can find them by Googling “photo books.” Some have a bigger brand, some no brand, but they are the same type of books. By trade they are known as the “press printed books” because they use the same type of ink, paper, and press print method as magazines and catalogs. Press printed books are like magazines. They’re thin, weightless and lack the solid feeling of a real book. Flush mount books are built like a brick, they feel robust and their weight carries a crafted feel. Standard press pages are flimsy and bend out of shape with each opening. Flush mount are rigid and meant for rigorous use. Thin pages in press printed books easily wrinkle after light playing from children. Our .08mm thick flush mount pages don’t bend so they always retain their shape. Press print books use the same paper as found in mass produced magazines. Flush mount books use real silver halide photo paper that comes with a beautiful Lustre finish. 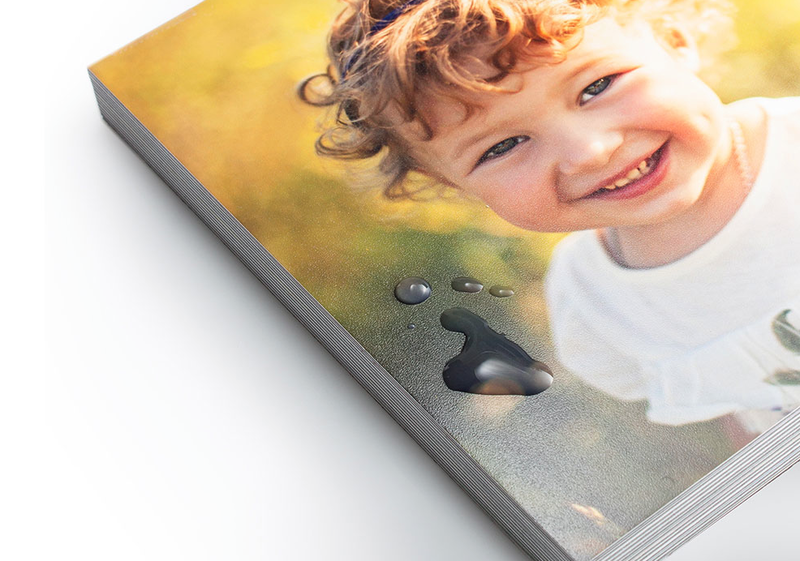 Standard press paper absorbs stains but our flush mount books have coating that protects against spills and stains. Guarenteed to be stain and fade proof for 100 years. Traditional inkjet printing uses a CMYK halftoning method. This consists of small dots packed closely together to give the illusion of transitions. Halftoning can never faithfully reproduce a photo’s true tones, depths or gradiations. If you examine halftone prints closely you’ll notice grainy noise added where there should be soft smooth transitions. It does not matter whether a printing press uses 4 colors, 6 colors or 8 color “HD” printing. They all rely on halftone CMYK technology, which is fundamentally gamut limited. Real photo printing doesn’t use halftoning. Instead it uses a chemical process done through exposure practices that have been practiced for 100 years. The final result is a real photo with truly seamless tones where no transition is apparent. Our flush mount books use a layflat design, which gives stunning panoramic views. 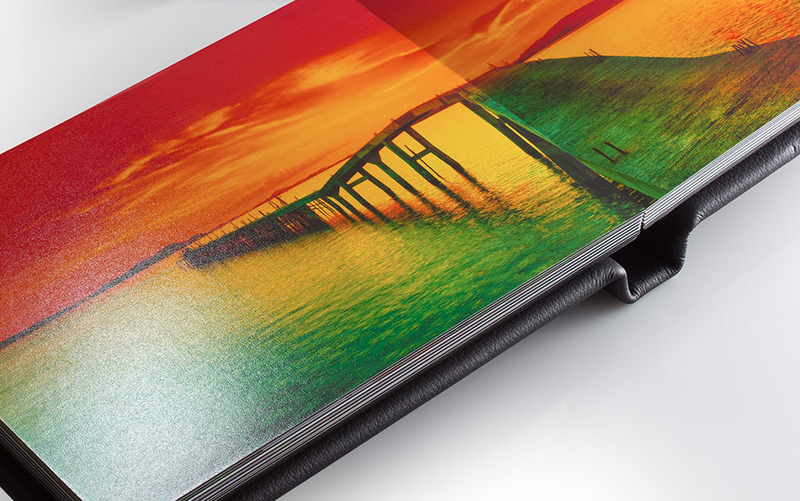 Layflat binding allows the image to be uninterrupted so you dont lose the image inside the gutter. Our books have stitched library bindings to ensure a long lasting book. We source only the highest quality Leatherette. This means deeper grain patterns, superior texture, great laser engraving potential and a lifetime of durability. Available inWhite, Pink, Camel, Red, Kiwi, Blue, Espresso, Black. Engraving and Cameo windows also available in the option. 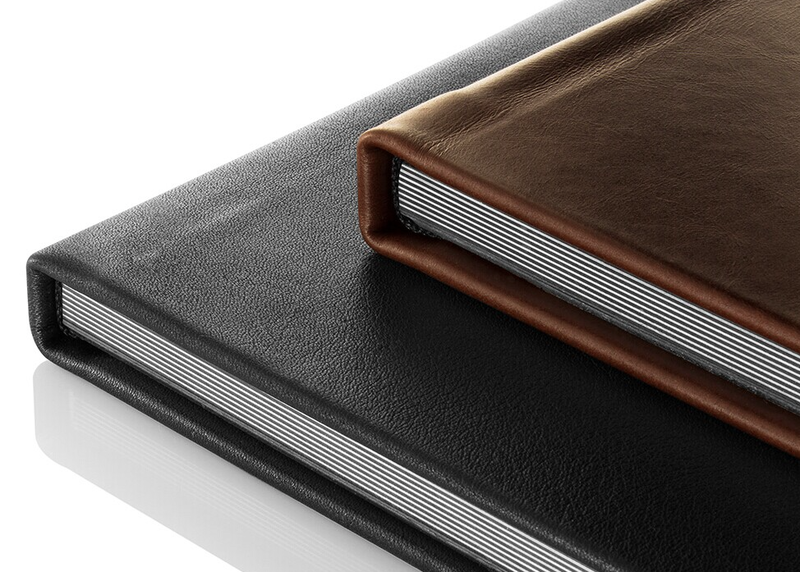 For just a little extra you can upgrade your Classic Leatherette Book to our premium genuine leather cover! You can choose between our rustic Brown or classic Black. Cameo windows and Laser engraving available in this option. 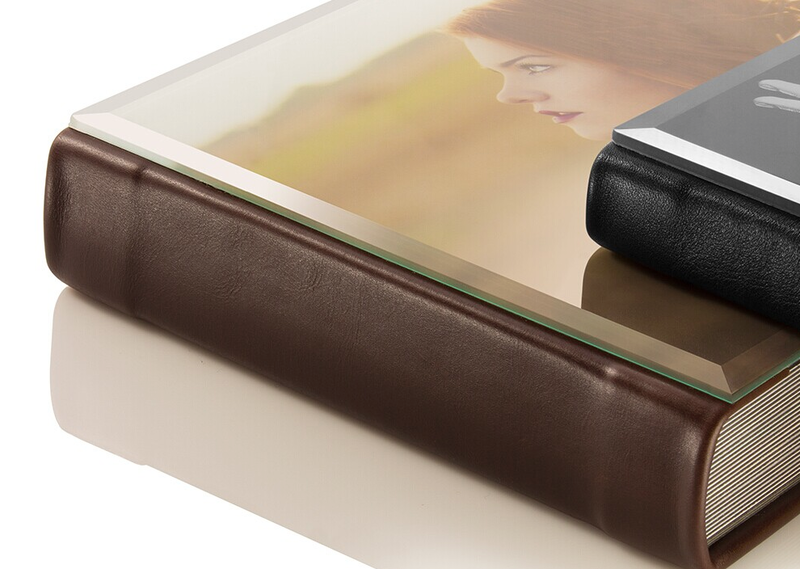 Our Crystal cover books offer a premium album with a hardened, Anti-Scratch, Precision Facet Cut Glass cover. Glass can feature one or multiple cover images with or without text. 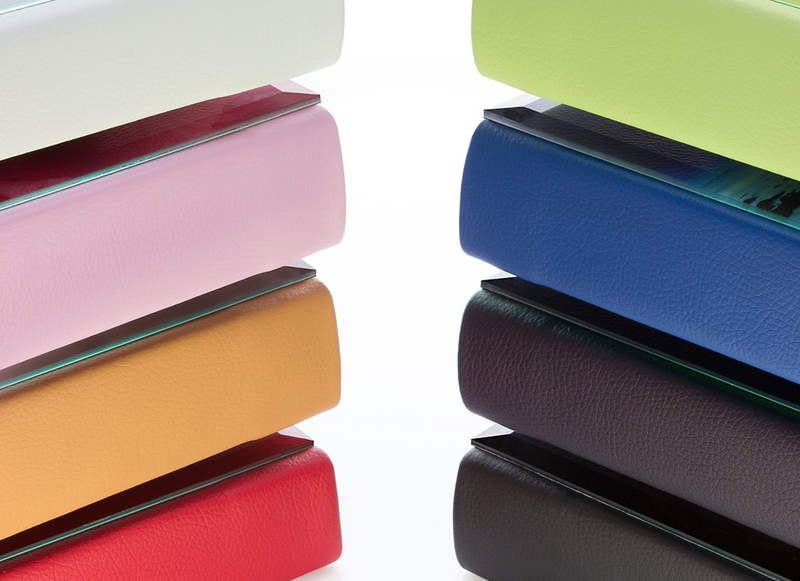 Glass covers may be combined with all colors of leatherette and real leather bindings for a modern and elegant look. Forget old fashion foil stamping and debossing. Truly beautiful text requires laser precision. You can now make a truly unique book with names and dates featured right on the cover. Our parent books are 6×6 flush mounted copies of your album. They are matched to the cover choice and page length of your album. 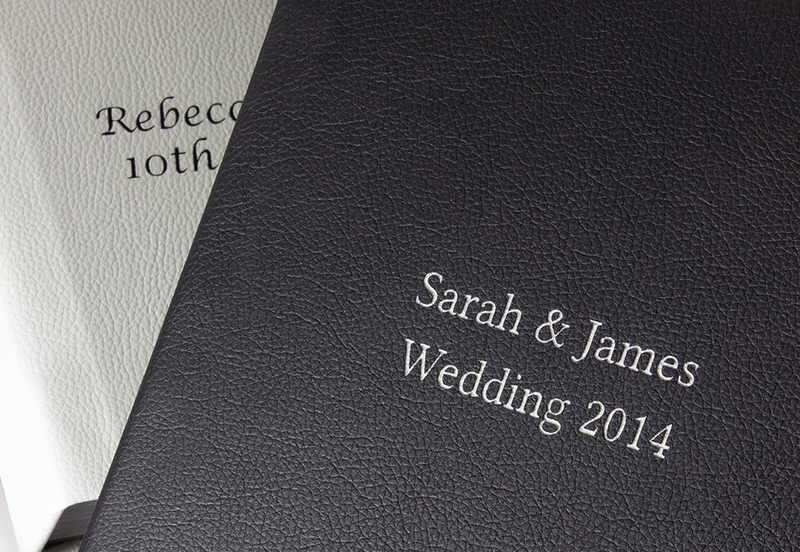 Parent books for Crystal Cover books will be matched to the leather choice of the album. You may choose to also order a presentation box to house your album. 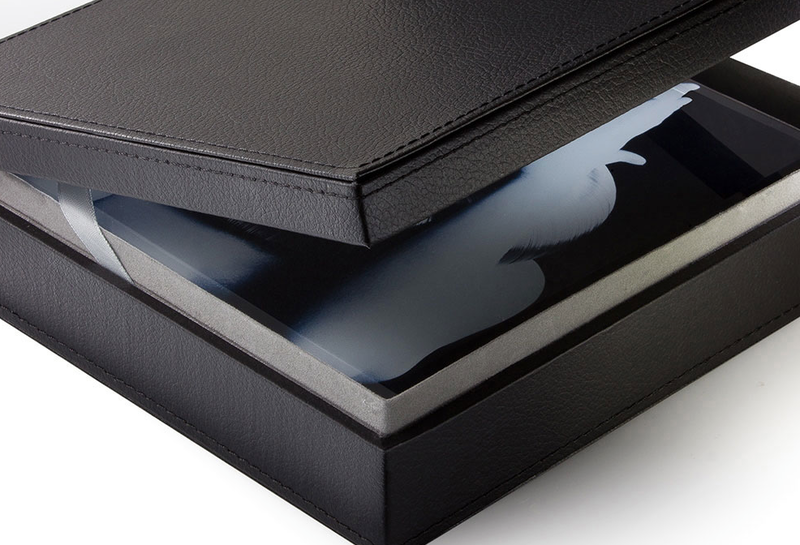 Boxes, like our albums, use high quality leatherette and are hand-constructed and hand-stiched for highest quality.